Q. I'm really interested in starting my own vegetables from seed this year using soil blocks. But I'm finding quite a disparity in the basic "recipes" for soil block seed starting. They generally involve peat moss, soil from the existing garden, perlite, lime, compost and a fertilizer mix of bloodmeal, greensand and rock phosphate; but they vary. Some omit the garden soil, some omit the lime, and the amount of the fertilizer mix can vary greatly from recipe to recipe. I've also been told to find another source of potassium because greensand takes too long to break down to be effective for the young plant's needs, but I am doubtful of this information. Can you give me any advice? A. I would never ever ever include garden soil in a seed-starting mix. But yes to milled peat moss; and yes, you then need a tiny bit of lime or hardwood ash from a wood stove or fireplace to balance the pH, as peat moss is acidic, while lime and wood ash are alkaline. (But you only need a tiny bit; say a teaspoon of lime or ash per quart of peat; "a little dab'll do ya"). Perlite—a mined volcanic mineral that's popped in big ovens until it looks little Styrofoam balls—is absolutely essential in a seed-starting mix. It allows more air around the roots of the developing plants, provides less resistance to the growth of those roots than almost anything else you could use, and greatly promotes drainage. But that 'fertilizer mix' just sounds weird. Your source was correct; greensand takes quite a while to become available to plants; same with rock phosphate. In the outdoor garden they're typically added to the soil six months to a year in advance to give soil microorganisms time to release the power of their (respectively) potassium and phosphorus. Bloodmeal is a slaughterhouse by-product that does provide Nitrogen, but it's fairly 'hot' and could burn tender young plants; and it certainly wouldn't be the first choice of plant food for vegetarians. And I personally don't get the idea of soil blocks—hunks of dirt pressed into a blocky shape with a specialized device—at all. 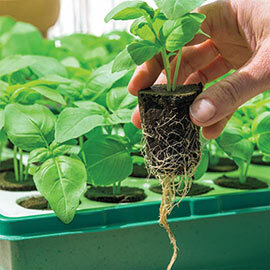 So my ideal seed-starting mixture is for use in containers—recycled garden center six packs or similar vessels that retain water, provide excellent drainage and are long and deep enough to allow maximum root growth. Now, when I make my own seed-starter, I mix equal amounts of milled peat moss (with a little bit of ash from my wood stove to balance the pH), perlite and screened compost. But I start a LOT of seeds, and often use packaged mixes to save time. These can be called 'soil-free mix', 'professional mix', 'sterile medium', 'seed starting mix' or something similar. Some companies substitute coir—shredded coconut fiber—for the peat moss in their mixes and that's fine. 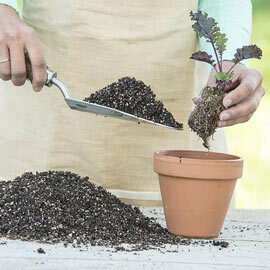 Some premium mixes will include small amounts of gentle natural fertilizers like worm castings, and that's excellent. Just don't use mixes that contain chemical fertilizers like Miracle Grow or Osmocote; or ones that have added so-called 'water-holding crystals'. (Note: These tainted mixes may be the only choice at big box stores). Q. Dave replies: "OK Mike—tell me how you really feel; don't hold back! (LOL!) Now, I really want to understand the WHY of a few of these things. I believe the garden soil is meant to prevent some form of shock when transplanting. You seemed very passionate in this answer, what can go wrong by adding a little soil? It's the same soil the plants will go into in two months; right? And why are seed blocks bad? Last year I used toilet paper cores to start my seeds and planted them right in the ground. That worked fine, but I'd hate to not use the $100 block starter I already paid for! A. Yes, garden soil is where the plants are going to go eventually, but that soil can contain weed seeds and harbor disease organisms—both of which are much bigger threats to baby plants than big ones. 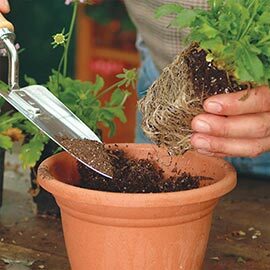 Most garden soils are also heavy with clay, which may help soil blocks hold together better, but sure seems to defeat the root-enhancing purpose of a light, soil-free mix. And having garden soil in the mix won't lessen transplant shock one bit. The best way to avoid shock is to not plant outside too early in the season, to 'harden the plants' off by gradually acclimating them to the great outdoors for a week before actually putting them in the ground, and to install them in the late afternoon instead of early in the morning, so they can get settled in before they have to endure their first long, sunny day. And finally, I never 'got' soil blocks because by definition they compress the soil, which is the opposite of what's recommended for helping baby plants develop deep roots. However, I DO like your toilet paper core trick. Those little rolls of cardboard have enough depth for excellent root growth, won't impede that root growth when planted outside, and will decompose over the course of a season. Slide them up a bit at planting time and you have instant cutworm protection as well! Is the block maker attractive? Maybe you could pose it on a piece of marble and call it art!